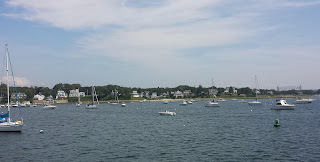 This morning found us anchored in Onset Bay, near the community of Onset in the town of Wareham, Massachusetts (map). We really did not need to make the stop, as we arrived early enough, and with plenty of flood tide remaining, to complete the entire Cape Cod Canal and on to Plymouth bay. We had heard, though, that it was a pretty stop and had a good pizza joint. Onset Harbor from our deck. That's the canal rail bridge to the right. 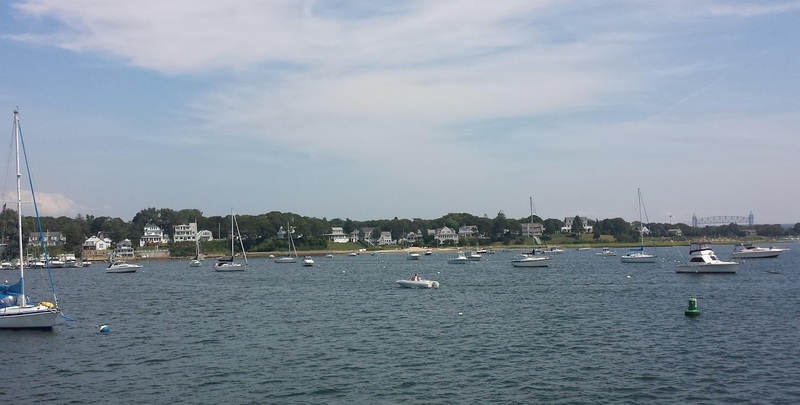 These marinas are a ways from town; the town dock was not visible from deck, obscured by Wickets Island. 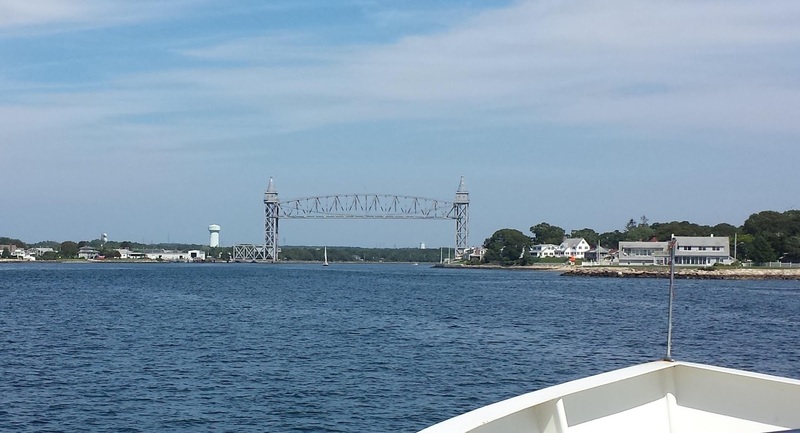 We had timed our departure from Wood's Hole right at the tail end of the ebb, to have a push through the hole and then a favorable flood current all the way up Buzzards Bay. That put us in Hog Island Channel, officially part of the canal, just approaching maximum current. As we turned into the regulated channel I called Canal Control to check for heavy westbound traffic and give them a heads-up, even though, being less than 65' overall, we are not required to report. As we arrived at the entrance from the canal to Onset Bay channel, we had three knots of current with us. To make the tricky turn, I ended up turning the boat 90° a good hundred feet or so before the turn, letting the current carry us sideways until I had the inlet lined up on the nose. A quick burst of throttle shot us out of the canal and the current, and it was a more or less normal cruise from there to the bay. At dinner time we splashed the tender and rode the half mile or so to the free town dinghy dock. We walked up the hill to Marc Anthony's and enjoyed a classic meal of pizza with a pitcher of beer. Afterwards we wandered around the small town before returning to the boat. This is clearly a vacation town, but with a very different vibe than Newport or Martha's Vineyard, a bit more down-to-Earth. 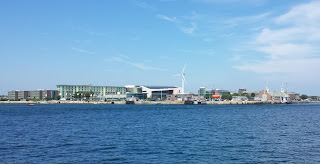 The Massachusetts Maritime Academy, along the canal in the town of Buzzards Bay. 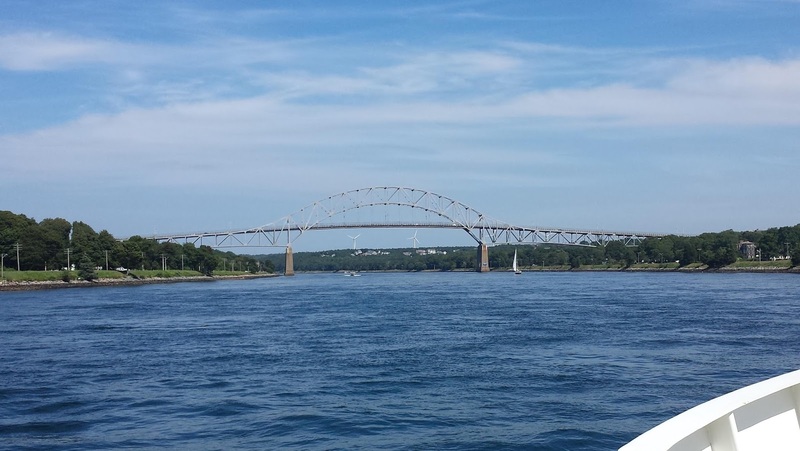 This morning we relaxed at home, waiting on another favorable tide to finish our journey through the Cape Cod Canal. 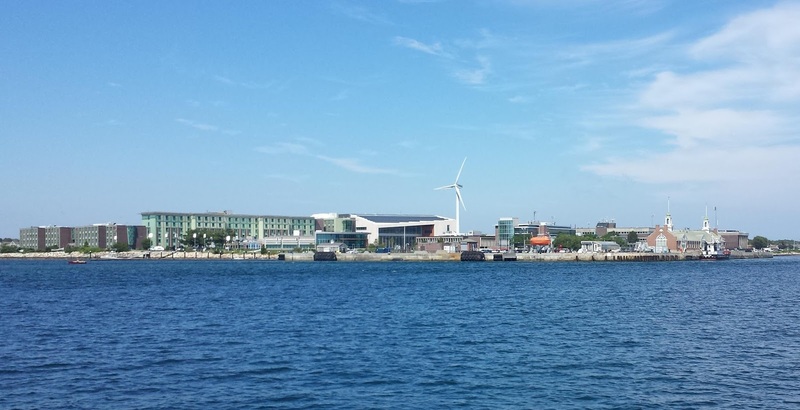 The currents in the canal are fierce, up to four knots or so in the middle of the man-made portion, and getting the timing wrong can be a costly mistake. We weighed anchor at 1:30 and had so much of a push that we struggled to keep to the canal's speed limit. Once again we contacted Canal Control before entering the regulated channel. Approaching the railroad bridge with its decorative tower caps. You don't want to see this down with three knots behind you. Trails line both sides of the canal and we saw quite a number of people out on a beautiful day taking advantage of them. There was even a busload of tourists at the visitor center in Sandwich, which we had visited when we were here in Odyssey. I had to steer by hand through much of the canal, with over three knots behind us at one point and plenty of eddies and riffles to cross, so I did not get as many photos as I would have liked. 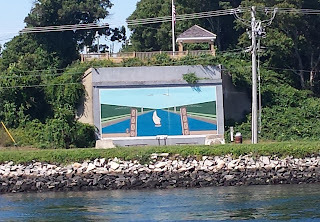 I did, at least, capture the three bridges we passed under; we made certain the railroad bridge was fully raised before we even entered the canal. The Bourne Bridge. No relation to Robert Ludlum. 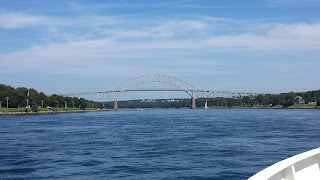 The Sagamore Bridge. We went over both of these in Odyssey. As I type, we are under way across Cape Cod Bay, dodging lobster pot floats. One consequence of the late timing of the tide right now is that we could not make Boston Harbor in a single day, so tonight I expect to be anchored in Plymouth Bay someplace. That would be the very same Plymouth of Rock and Plantation fame, where the pilgrims landed, but we have no plans to go ashore. Tomorrow we will make Boston Harbor, with a short detour outside the three-mile limit to discharge our tanks. This piece of art faces the canal, depicting an earlier version of the canal. Am I the only one that detected a bit of cowboy in the first three paragraphs? Yeehaw Cap'n Sean. I know it was all done with calculated flair, but who doesn't like a 90 degree crab just for fun?